Deciding what to offer as a prize for your contest can be tricky. If you’re giving away a trip to Aruba, you’ll certainly attract a high volume of contestants. But will these entrants stick around after the contest? Attracting only badly targeted contest junkies is unlikely to lead to lots of book sales. A swag prize pack with reader-related merchandise such as pens, stick-on tattoos, coffee mugs, cozy socks, audio and print copies of your book, costume jewelry, scarves, etc. 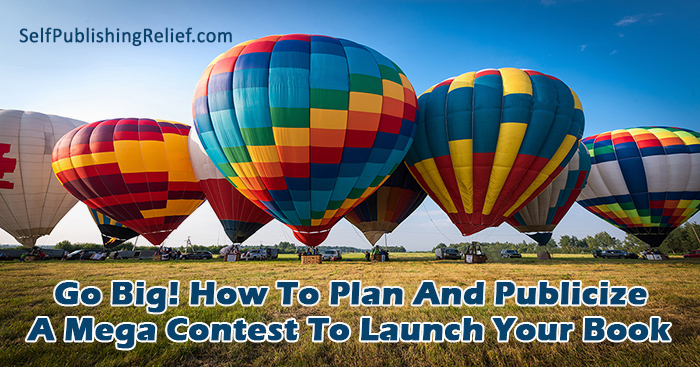 Beyond promoting your book launch, what else do you want the contest to achieve? Deliver more newsletter subscribers? Gain more Instagram, Tumblr, or Twitter followers? Or encourage shares or retweets to spread the news of your book release far and wide? How many prizes will you give away? Will the contest be open to US entrants only, or will you ship internationally as well? Are there any age restrictions to the contest? Consider this especially if you’re offering books with mature content. Yes, it’s possible to manage your giveaway promotion by yourself. You can count the social media comments, likes, or new followers, assign each entrant a number, and then use a random number generator to choose a winner. But since it’s your book launch, you may have other marketing and promotion tasks to tackle. If you’re truly opting to go big, check out Rafflecopter or Woo Box. These services are built to manage contests and giveaways and make the process easier for authors. Craft a bright, eye-catching visual of the prize for all your social media posts. Check out Canva for DIY graphics. A clear explanation of what they have to do to enter: comment on the post, like the post, follow the author, share the post, or direct them to your website Rafflecopter entry form. Make sure you follow all social media contest rules. Make sure to send an email blast to all your faithful followers so they get a heads-up about the prize you’re offering. Check out these examples of splashy mega-contests for more ideas. When the buzz has died down and you’ve sent off the last winning package, take inventory of your promotion’s success. How many new newsletter subscribers have you gathered? Are your social media follower numbers up? Are you seeing a jump in sales for your book? When done well, contests can raise your author profile and effectively help you sell more books. Question: What’s your favorite kind of book-related giveaway?